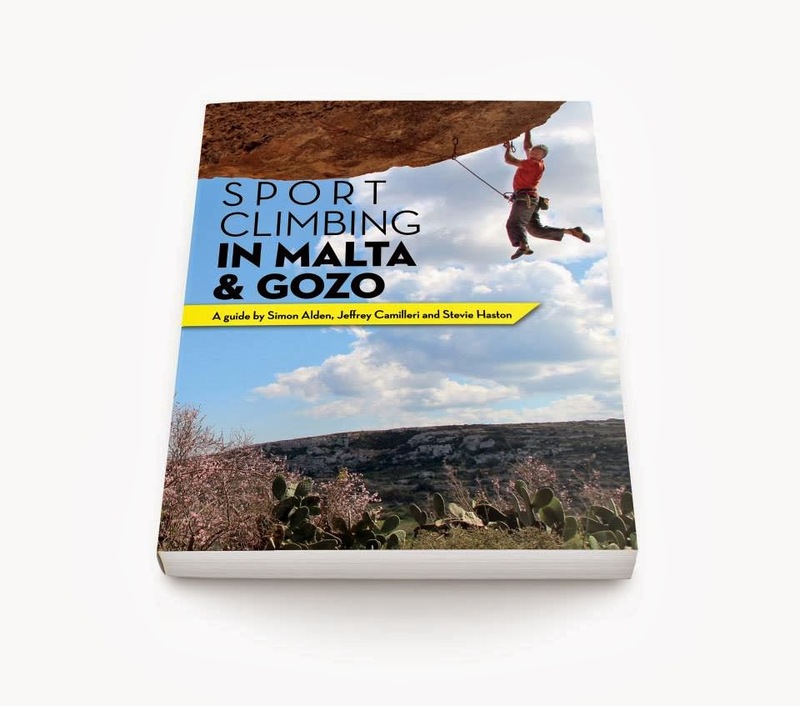 I've been invited to join the MMC(Maltese Climbing Club) to go the San vito Climbing Festival in Sicily, where Stevie will present a slide show on Maltese Climbing with some pictures of Kings of Kings and all the recent new routes. 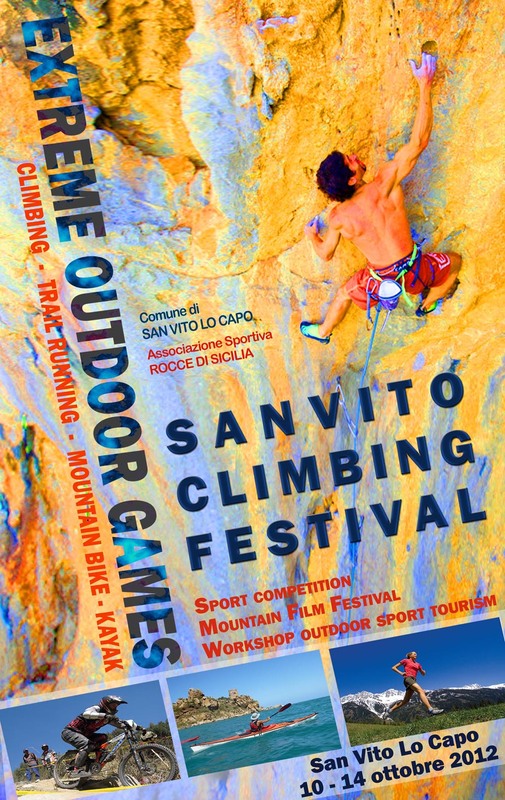 "The Prince who would be King" : Adam Ondra will be attending to, and he will present his latest DVD. You can read Adam Ondra interview wish was published in a few magazines on that link. Sicily sounds great, check out the program, it sounds like a fun weekend to spend in the sun and by the sea....with climbing, sea kayaking, trail running..... 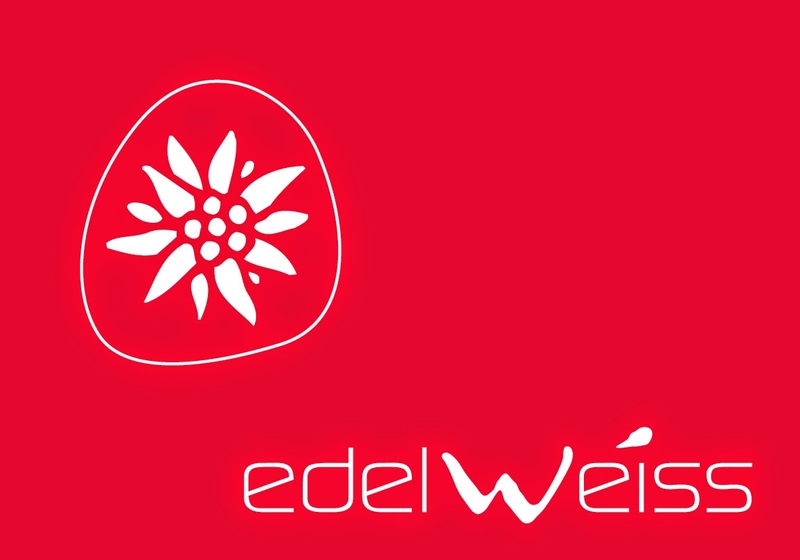 So book a flight and have a sunny weekend in Sicily, have fun and success. Congratulations to Edu's MARIN GARCIA father, Francesco Marin, he red-pointed Gemini 8b+ in Rodellar at 60 years old, after a year and half of attempt he sent it yesterday! Well Done!!! It seems that he has other projects....Venga! I just done my first 8b at 48 years old so I have an other 12 years to keep pushing!!! I'm keen, Momo, Stevie, Robyn, Francesco... have inspired me, so get inspired to, so train, loose weight, and pull! Have more fun, more birthdays, and more success! Sun Blas team was climbing at Sopu Tower, 4 new routes, one by Jeff and three by Stevie, al high quality on Crystal Rock! 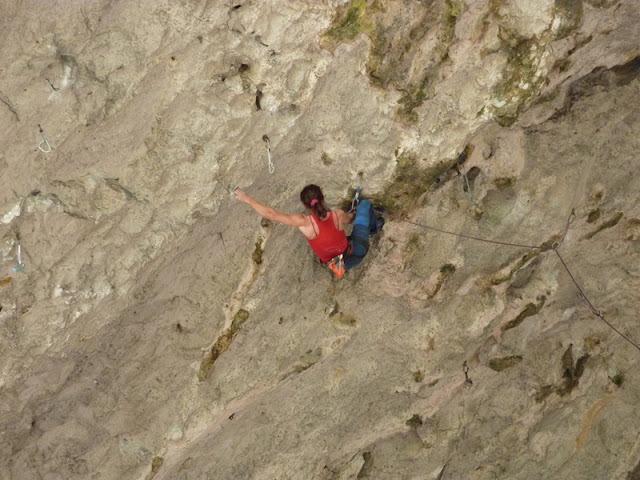 The German girl Verena is climbing really well, enjoying the small holes. Her lightweight frame is obviously an inspiration to us overweight climber. Verena at 42kg , half the weight of Adrian (84kg). Sopu tower is very technical with small holes and balance. The Maltese climbing population is always bolstered by foreign students, we all are very grateful for those seasoned visitors. Stevie on King of Kings, with Jeffrey Camilleri. Stevie is off to Malta and Gozo, for some new adventures in the Underworld. Thanks to Simon Alden and the MTA. Stevie kept those home made pegs, so he can use them during this trip....He already had his pastizzi on the Ferry!!! All packed in the Grivel Rocker, ready to rock! Perhaps the greatest mountain race of all the mountain races is over again-well it is still going on for some. 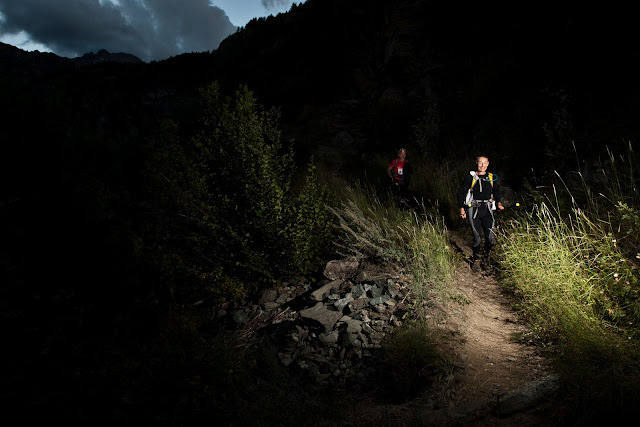 The TDG is 200 rugged miles around Aosta, with 24 thousands meters of up and then down! The winner came in the other day but I have waited to post some other results, and of course I sorry for not mentioning everybody including the last place finisher who is normally honored just as much as numero uno. There were 13 in under the magic 100 hour mark! Fellow Grivel team member Pablo Criado Toca finished 4th, and Marco Camandona, came in at 100 hrs 48 mins, you shouldn't have stopped off to drink so many beers Marco! As usual it was a great race, I'm very sad not to be there cheering people in, special thanks ,well to everybody as usual, especialy the thousands of volunteers. The relief of not doing the course, I must say is an interesting feeling, but I have got up each morning before the sun, and run in the dark (and rain yesterday) to do the runners homage. Aosta I love you. The Tor I love you. Run until you drop, pick yourself up, and run some more. Cant believe I am not there. Click Here a personal account of Stevie doing the first tour. Two books which are worth a read, one because it's about the dishonesty in politics, the other a decent Bodice ripper which takes place in the Abyssinian campaign where there was more excitement than in all the books together in the total Boardman and Tasker list. Wow the Boardman Tasker book award, the list of books seems to be written by people who cant climb very well, or in at least one case, someone who cant climb very well and who hasnt climbed a route in 20 years! I cant even stoop to honesty in criticising nearly all of them, as it will seem too mean. So, in that modern way we have now of wishing everybody goodluck, and well done, em... well done and good job on being great climbers in the spirit of Boardman and Tasker and reflecting what is going on at the cutting edge of mountaineering! I really had trouble with this list, is there a person on it that has actually meant anything to British or world climbing? May the judges choke on their paid for Coco! Making monsters is what its about, but in the end monsters devour themselves, or just rip themselves apart. I did it just over a year ago running in a 200 mile run, half way I slightly tore a calf, but of course I continued for a while and made it much worse. 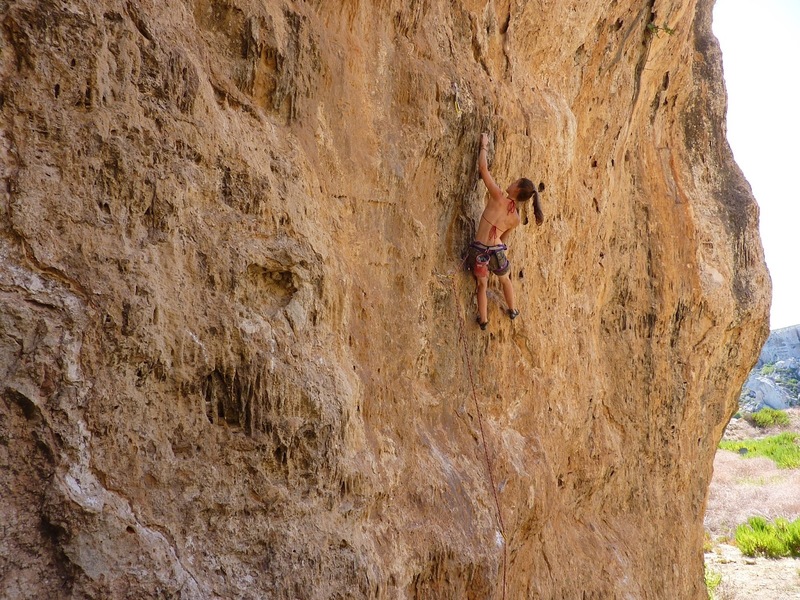 In climbing you don't have the luxury of even time to consider, it happens very quick. Above is standing or upright row, its very good for shoulders, you really need to watch your self in a mirror to watch for imbalances! My shoulders are good again, because I sorted them out. Zottman curl is one of Laurence's favorites and she has great forearm strength. 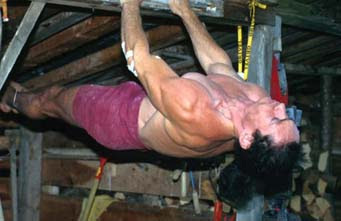 Zottman used very heavy weights but climbers have slight musculature so can go light with good form. The Zottman curl is a normal curl on the 'Up' movement and a reverse curl position on the 'down'. The down movement, where you can also wiggle your wrist a bit for a bit of a burn if you want or to just feel the articulation. The rope curl is interesting, depending on where you lay the knot, it will seriously stress different aspects of the wrist and bicep, a very useful exercise for bicep health. This is the Cuban press, again a favorite of Laurence, but one she's been neglecting, she doesn't have time for everything, but she has to make time or she will tear her self apart! Cuban press is great for rotator cuff, good form, a mirror, and light weight are a must. You can do Cuban Press with a bar if you want but it stresses some peoples wrists this way. Remember we are all different, the only thing we have in common is that we can get injured. My shoulder impingement is gone! Monsters are easy to create, but climbers are notoriously injury prone, thats why most of them are light as feathers, but even this won't stop injury, it just means your injured on harder things. Mutants get hurt, Machines break down, Alpine Annihilators get aged knees, the body is a great device but its design was just the accident of evolution, protect your knees, shoulders, finger pulleys and everything else as best you can. Learning to love my 20 kg plate didn't take long, but as with any kinnda man, there's different kinds of love, from the slight flirt, to deeeep Barry White Loooove. My Lats are a bit beat, but my bi's and Brach's are still game. A few days ago did a big session of pulls, and so felt like hitting a different pulling combo. Trying to lock it a bit on each pull on a different arm, either I am clipping in my mind or adjusting my fingers, or putting in a bit of gear. Neutral grip is great on the elbows, and a nice big flat thing so I am not concentrating on my fingers! Zulu likes his 20 kg plate, he trains with fishing in the hole for mice! These are lots of fun, not fun for long! It's a combo pull over, sit up, and get up. It takes a little bit of concentration, and seems to engage the core in an interesting way. Its really raining a lot had planned to do a big cave, some mapping, and exploration etc but its a cruel cave at the best of times, so a bit of house training! This 'beret wearing' exercise is really hard! 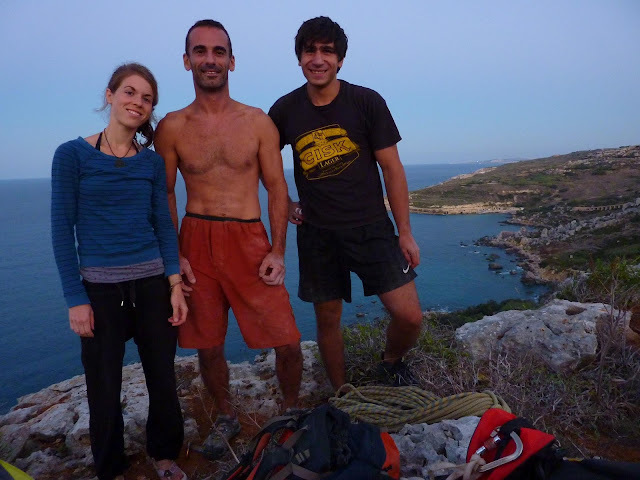 Laurence just did Reine de Sabart, a very burly 8b grade rock climb, its her hardest route. Reine de Sabart, translates as queen of Sabart , but really it might as well be called King Gong of the universe, its a 26 meters roof after all! So Laurence why haven't you climbed this well before? Ans: I have climbed even better before but I was just bigger, bigger legs from mountaineering, snowboarding and stuff. I am now a bit nearer what a climber should be. And of course being a yoga teacher has contributed greatly. So will you do harder routes? Ans: Hopefully yes, this felt very nice and liberating, but its a matter of time money and getting round a few things. What is Reine de Sabart like as a route? Ans: Oh fantastic, one of the great routes worldwide, I nearly got it a few times two years ago and then dropped a trailer on my foot, it felt easy today, but as I got near the chain, there was an almost mad impulse to blow it. I was much stronger two years ago, but little details like hip flexibility and being slightly calmer work much more than you would think. Kundalini Yoga has helped me immensely and that even mattered more than having a husband who climbs well. Why are girls and children climbing so well? Ans: Because they are closer to the ideal weight, but obviously some lucky men are the right weight too. Ans: Not very strong, I have strong fingers, a strong core and obviously I know how to climb from years as a climber, but there is a good connection between the three elements, perhaps my mind is fairly strong too. You won and competed in ice climbing are you a competitive person? Ans: Competing was purely for money, the comps were not very interesting, real ice climbing was at that time the most interesting side of climbing, engagement of fear, beautiful ice, and the chance to explore. They were good times. And now you don't climb ice or go to the mountains. 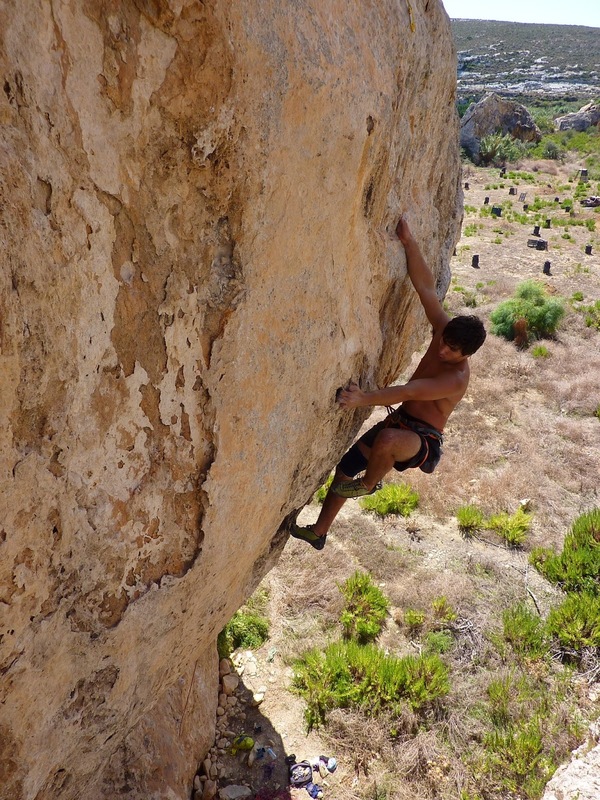 Ans: I simply can't afford to go anywhere except local rock climbing but if I improve at rock I might visit Spain . How old are you? Your height and weight? Ans: 48 years old, 159cm, 48kg. What would be your maximum level? I woke up this morning feeling weird that I wasnt in it as so many friends will be there, then I felt a more rational feeling of relief that I wasnt facing the 200 hundred miles! These my old rocks! A 55 kg, an 80 kg an the big one we can't weigh! 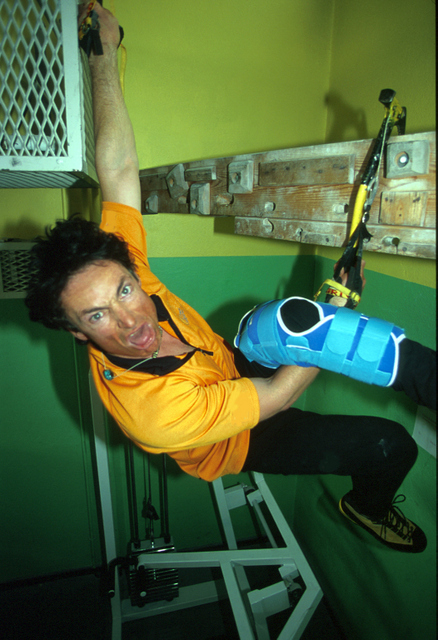 This photo was prompted by Peter Beal saying something about my home made gym, well Peter all that is gold does not glitter! When I was young I thought I was not quite right in the head, subsequent years have proved conclusively that its the rest of the world thats out of its collective mind. When you train with body weight, you get good with body weight. Above body weight is heavier! Unbalanced moves are good, Romanian dead lift is better than normal, round back although dangerous in lifting can be a useful thing to learn for climbing! Many things to learn and they are all in that book published in 1972! The core is a much publicized part of the body, but really misunderstood. I will add to that misunderstanding by giving you some stuff that you won't follow, or try to understand. Why not, miss information is the way foreword. Warm up and do the Bug series of exercises found here. Or do a good warm up, like the Sun Salutation after a bit of jogging, or skipping, or little jumps. Or do some really easy climbs which are kindda just walking. Yoga and Pilates are really both good, as are any of the myriad martial art warmups, which are taken from yoga anyway! The center is where all the Power can emanate from, this is illustrated here by something that shows a flexed back. This is not to confuse you but to make you think. Where does the core start and where does it finnish. People borrow and steal and develop and sometimes perfect things. This is a 'standing Twist with a weight,' its a really brill thing to do, after a warm up. I do standing twist, or sitting twist, several times a day. I don't just do them to become strong, I do them just to function. This is Laurence doing what is sometimes called Russian Twists, she has a bad back with one damaged disk from falling down a couloir when she was a 'ski bunny', she has to be careful so she is very careful! You might recognize this from yoga, you can call it a twist if you want. This is a Plank Twist, you can call it a MF of an exercise if you want, but my guru will be upset at you swearing, so we will just call it the heavy Plank Twist. Once upon a time I got very strong doing the Plank twist! The core in my opinion is really you, just you, and all of you. The rest of the universe, like rock climbs, mountains, must move around you! 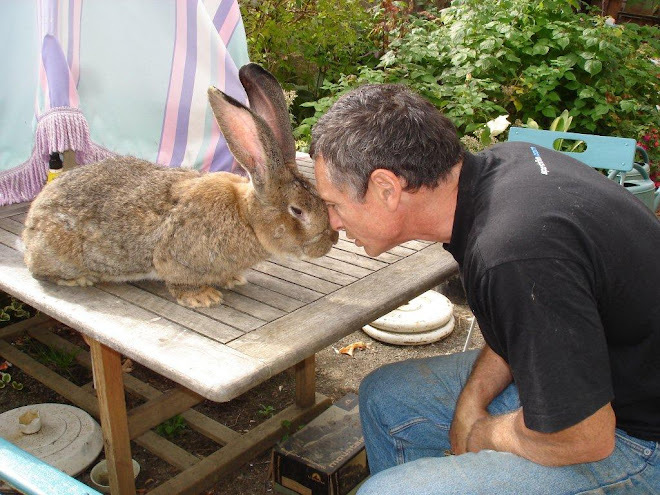 This is a bit of cross training, called "gardening", it involves twisting, hand strength, and other stuff.... In Ariège where we live, there are two 8c climbers who are full time pro gardeners! This is not a joke! This one is for Jurgen, who just had his Patella out and missed a comp. Notice the Panda bear snowboard eyes! This is for all you out there with tennis elbow. Over the handle bars on the push bike. Only fingers that work are the little ones! Wolfgang Gullich was asked once if training one finger was dangerous and he said, 'No it is good, other fingers get chance to recover'! This 'turkisk getup' is actually good for climbing, obviously not good for wrist fingers etc, bit of balance and co-ordination fun. Probably better to wear a helmet and think of it as Alpine training. Tried it with a 20 kg plate, nearly murdered myself. Smile and be grateful your not injured, go for it, big regret of mine, not doing enough, making excuses, being a cry baby bunting.